Unlike ' vlogger ' the word blogger is widely recognised and understood by many people, of all ages, however, although the term may be understood does it mean those people really understand what it is like to be a blogger! I have been blogging, coming up to two years in May- which is a long time! Deciding to make a blog on that random day at the end of May was equally the best and worst thing I have ever done! It's given me so much confidence, allowed me to meet so many amazing people and allowed me to drive my innate creative side- something which I am continuing to nurture! 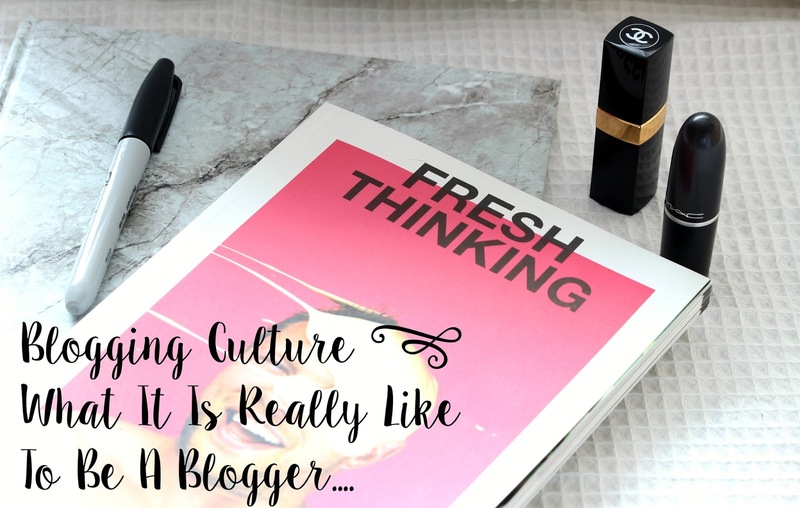 However, I think blogging is often glamorised and as a result people have miss conceptions about what blogging actually is and what it involves! Today I thought I would share with you some thoughts about what it actually means to be a blogger! Firstly, no matter how big or small your blog is stats, statistics, analytics- whatever you care to call them, will affect you! We can all stand here and stay they don't affect us and they don't mean anything! In practice, it is very hard to actually live up to this! We are all human! We, therefore, all seek validation! Some more than others but nonetheless, we want reassurance every now and again! Whether that be checking with your teacher about the homework, asking your mum what outfit she thinks looks best or getting views and comments on your latest blog post! And nothing, and I repeat nothing will prepare you for when your post doesn't do as well as you hoped! Your blog can be exponentially growing and then all of a sudden it hits a brick wall and your stats fall! It's devastating and something no one talks about because no one likes to admit that their stats mean something to them! It's okay! Jealousy within blogging is another area of blogging culture which is not talked about enough if I am honest! I think there are two types of jealously, jealously which results in you being hurtful or spiteful because you what want other people have and lethargic jealousy- you want what other people have but instead of being mean and nasty to the other person, it leaves you feeling sad or down about what you have! The second type is one which I think is much more present within the blogging community! Let's picture the situation... You do a post, you write it up, take the photos, you are really pleased with the way it turns out and then on the night you upload it, you see another blogger upload a similar post to you that you believe is miles better than yours! This is so hard to go through! Something which again isn't talked about a lot! Although you are so happy for your friend's improvement and progress, who's start to doubt whether you will ever be fulfilled or satisfied with the content you produce! No matter how many lovely comments or tweets you receive at the end of the day if you don't start believing in it- no one will! But again there is no magic potion for you to start believing in yourself, it takes time and dedication! Just like everything else in this world! For a very long time, I was very much influenced by the content I read on blogs as I started out! They all said that the blogging community is amazing, everyone loves each other portraying it as this magical world, filled with positivity and unicorns! Until recently this is very much what I believed in! I never experienced any negativity in the blogging community so therefore, just assumed that all these claims were true! In actual the fact, the blogging community isn't always as nice as people may try and convey! In my own personal experience, the blogging community has been nothing but positive! However, that doesn't mean I don't still sit and witness indirect negativity passed between bloggers, especially bloggers that I like! Bloggers like most people in the written communication industry have strong opinions! With any strong opinion comes strong backlash, from people with the exact opposite opinion! Naturally this tension and disagreement often lead to arguments and a bit of drama on Twitter! At the end of the day, we are all human! We all have opinions, that we want to express and believe we have a right to do so! Somehow it's been portrayed in the blogging world that this isn't the case! In actual fact, it very much is but no one likes to mention it! It's okay to have healthy discussions, raising awareness of different opinions and views- educating others! What's not okay is cattiness and bitchiness! Unnecessary slurs that are harmful or inappropriate! The blogging community isn't always as nice as people think it is and it's important people realise this! We need to stop fabricating the truth and open our eyes to what's actually out there! Thanks for reading! I actually wrote this post a while back and I must have written it late at night or something because I completely forgotten I had written it until I was cleaning out the memos on my phone a week or so ago. I was actually quite impressed with some of the points I made in it, something must have hacked me off! haha! Anyway, I hope you managed to get something from it! Let me know any of your thoughts on the topic in the comments! I feel the exact same way sometimes! Don't worry you are not alone! Like anything in life, blogging has its negatives and positives, ups and downs. But I do think on the whole the blogging community is a great place! This is brilliant! It's important that people see that there are both sides to the community. I also think that most people don't understand how much work being a blogger is - it's practically a full time job! A lot of people do think it's a walk in the park. I totally feel you at the blogging jealousy. Nobody openly talks about it (kudos to you that you did) because it totally happens to all of us but we need to cope with others' success and be happy with our own. LOVE IT!